With the release of Picasa 3, we made many updates; improvements to keywording and tagging are no exception. You probably knew about Tag button next to the Search field, but did you also know that CTRL - K, and CTRL - T bring up the tagging dialog? 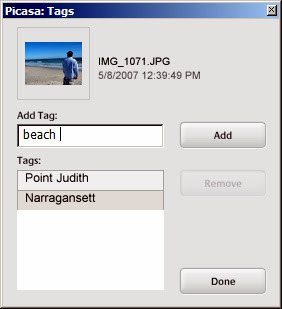 While editing photos, this keyboard shortcut is very convenient to help you add tags on the fly. The blue status bar at the bottom of the screen now shows any tags applied to your pictures -- this works on the single image, and the album level. View > Thumbnail Caption > Tags. Last, but certainly not least, bulk tagging is faster. Oh and, by the way, we also have auto-complete in the tags dialog, and in the Search bar.